When did hams start paying attention to gray-line propagation effects? Discussion in 'Ham Radio Discussions' started by W7UUU, Apr 16, 2018. I'm kind of a black and white type of guy, but the few times I've put gray-line propagation to use I was pleasantly surprised. Thanks Dave, the radio time wheel is in mint condition and I keep it safely stored away. During the 30's radio heyday there was all sorts of time wheels, slide rules and other gadgets for the radio enthusiast. Not quite the answer Dave UUU was after, this pre war radio times calculator, the centre wheel rotates and gives the times pm and am when the transmitting country can be recieved in your home country. The centre wheel will give an indication of a grey line although I think in those days the grey was not known as such. Remember seeing the grey line globes shown by W6RZ as youngster in the 1950's/60's. Unfortunately, not available on the At-A-Glance website. Probably no one there now would remember ever making such a thing. I'm still searching though... I would like something like that for here. W7UUU and VK2WP like this. I'd have to guess that lots of people understood the propagation along the gray line long before it became a common thing among hobby radio users. World War 2 would have put people with radios all over the world and using them regularly. Someone would have figured out the times and places of things, and put that together with the position of the sun. This might have been kept from public knowledge for as long as they could have, as this might be seen as a tactical advantage. Even before World War 2 there were ships at sea required to have radios and monitor them continuously. A quick search of the internet tells me that such radios were required by law in 1910. Log books from that time, as well as personal experience by the operators, should have given ideas on the nature of radio propagation. People that listened to radio broadcasts should have been able to figure this out to some extent too in the early days of radio. Someone had to write this down for the benefit of others, I would imagine, long before it ended up in things like tests for Amateur radio. Thanks for putting this up I did not even think to do a search. Very similar to mine which is round much the same style of lettering and the centre wheel is the same. I am lucky to have the paper envelope it came in. Radio was big back then and with the thousands of SWL's building radios of all sorts, commercial marine along with radio hams there surely would have been a ready market for these things. I also have the radio wheel calculator and all the papers for my Grundig 6001 although the Grundig wheel is nowhere as elaborate a presentation as the old 30's radio time wheel. Nowadays in the world of computers and internet such things are extinct I guess. In the early 90's, I bought silder rule type of set up for gray line. Never did use it so I sold it to some one interested. Wish I had hung on to it. A smidge off topic, someone here mentioned that Garmin GPS systems will display a gray line map and world time. Can't have both with seconds on the latter, though. A lot of very cool old school ways to do that in this thread. I've heard all sorts of strange phenoms credited to grayline - such as working JA from W6 with a 2 meter HT (I wonder if the guy was on Echolink?). I've experienced a lot of them, too. The only reliable way to work India and the Indian Ocean from W6 for me was in the morning on 40 meters, for the first two or three hours after sunrise. The VKs would be in before the VUs showed up. But I remember reading about grayline when I was an SWL in the 1950s, and I used it to listen to SWBC stations to my west. That was The DX Edge® ... see my post #44. 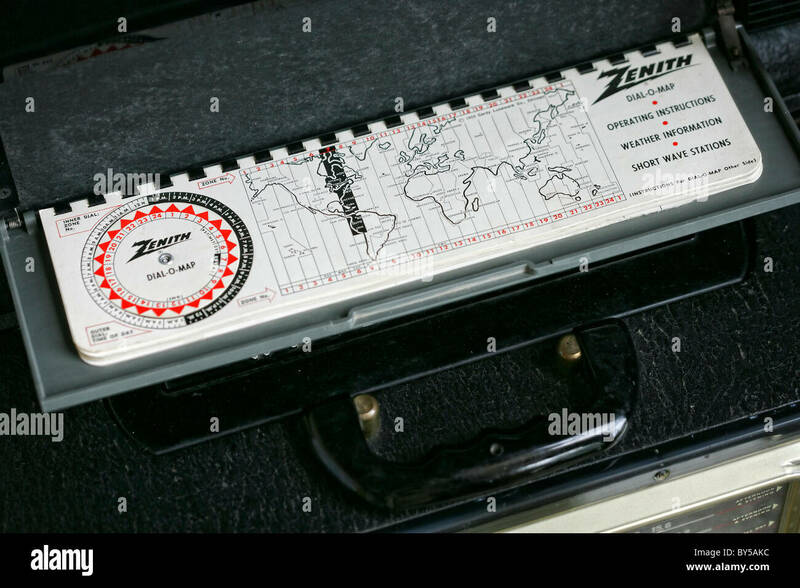 As a teen I lusted after the Zenith Transoceanic for my SWL addiction While not exactly a Gray Line calculator, the cover did have the means to visualize the thing. With a handy (Dial-o-Map) converter device. I'm lucky enough to have a '47 tube type and one the of last models made in the US - it has the Fm broadcast band on it.